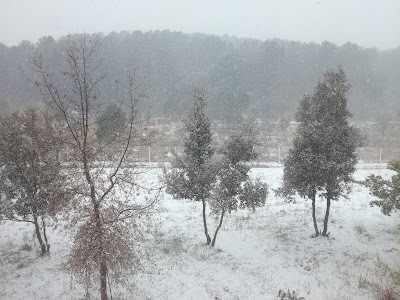 Yesterday we had the heaviest snow fall since I can remember, and I've been here for more than two decades. It started when I was at work. We didn't worry, it was supposed to turn to rain in the afternoon. As midday approached, it showed absolutely no signs of turning to rain. The temperature stayed obstinately low and the warm air from the south was stuck out in the Med somewhere. People started leaving. 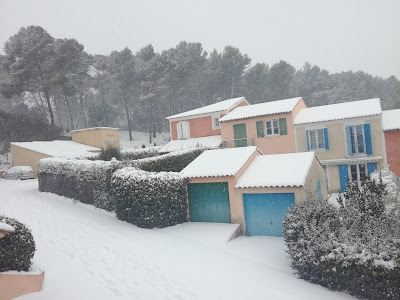 I hung on for a bit hoping for things to improve, but finally at 1.30 pm it was leave or risk not leaving because obviously I had left my tyre chains at home thinking that as usual, the Orange Snow Alert would be exaggerated. It wasn't, so I brushed the 10 cm or so of snow off my car and crept out onto the road. It was actually not too bad if taken carefully. I made it to the bottom of my road, a steep hill, and parked. There were no tyre marks going up the hill and I knew there was no hope of success. I climbed the hill, got home and immediately dug out my fluo pink ski suit, snow boots, and gloves, found the plastic sledge I'd bought when the boys were younger (which coincided with the last time we went sledging...) in the garage and went back out to sledge down the hill. I wasn't the only one out. There were kids throwing snowballs with their parents, and bigger kids attacking each other. After lunch, I went to find my sledge which I'd left outside, but my son had taken it, so found the old sledge that I'd had when I was a child. It hadn't been used since a feeble attempt on a thin layer of soggy snow some years back which it proved too heavy for. The several centimetres of dry snow was perfect for it, however. It took some steering, but eventually I got the hang of it, and instead of banging systematically into the snowy kerb, I got all the way down the hill, slight bend included by using my feet. I felt quite the Winter Olympic Luge champion, as there I was flat on my back on the sledge dashing feet-first down a steep hill. Fun! I was the only adult on a sledge, to the embarrassment of my eldest. 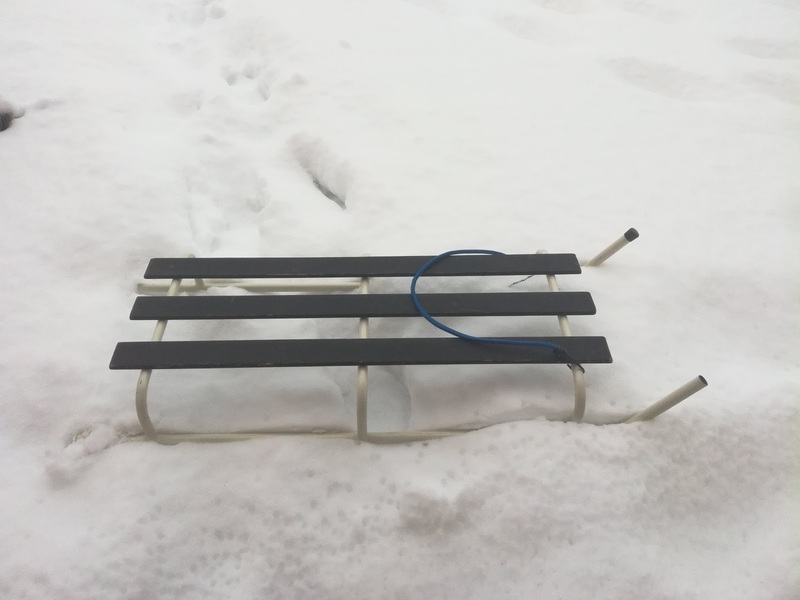 One of his friends skied down the slope, others used my other sledge, and then they went off. I'm not sure if this was in the natural progression of things or to get away from an embarrassing mother on the instigation of my son. 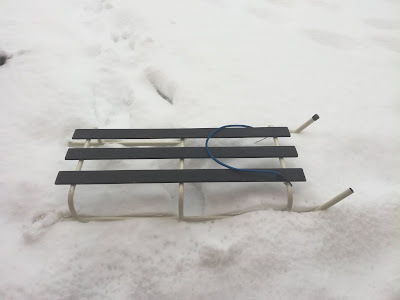 This morning, March 1, the snow has started to melt and is already too deep, soft and soggy for the old sledge, the the modern plastic one has not reappeared. Good thing I made the most of it yesterday! 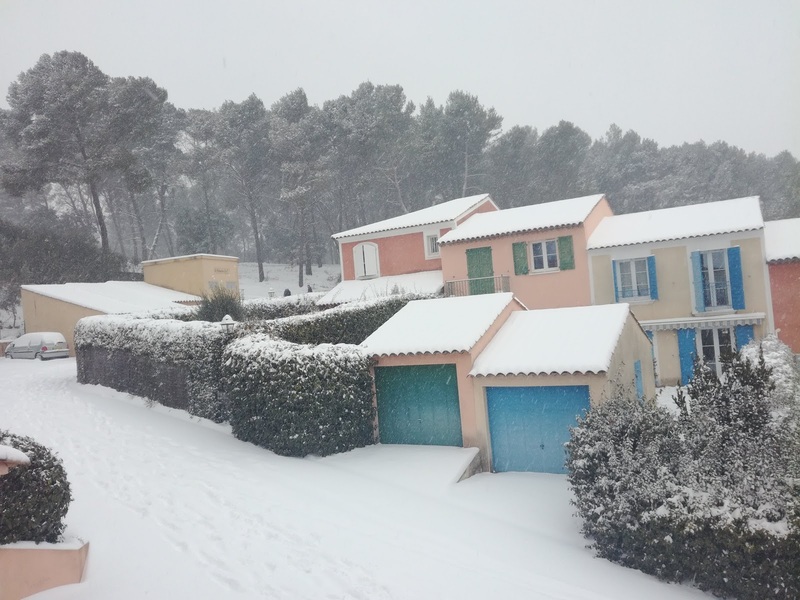 For more pictures of Montpellier and the region in the snow, the local newspaper, Midi Libre, posted a good selection sent in by readers here. That's brilliant - you sledging down the hill and embarrassing your son! And you got to wear your pink ski suit - result! We have no hills here: it would have been perfect for cross-country skiing....if only I'd had some skis.